Europeans love him, and the government hates him. Trump is in fact getting overwhelming support from the true locals, while false flag protests that are few in number and not well manned are failing for all but perfectly placed cameras. Trump is correct about Nato, and also correct about forcing Europe to pay its fair share. Comment sections cannot be adequately censored to stop the overwhelming show of support for Trump from Europeans. THERE IS A STRONG POSSIBILITY THAT THE ENTIRE STORMY DANIELS INCIDENT WAS STAGED TO DISTRACT THE NEWS CYCLE FROM JUST HOW DAMN MUCH EUROPEANS LOVE TRUMP, AND HOW WELL HE WAS RECEIVED BY REAL PEOPLE. e.g. who bothers to get placards printed of this quality and cost unless funded? The anti-Trump report in Birmingham was pathetic. 200 people at most with the same placards exactly as in London. Half the 200 look like tourists stopping to listen in amazement to the ‘entertainment’. Trump’s mother was a McLeod from the Isle Of Lewis. Britain is his family home – or Scotland. There were never any anti-Clinton reports in the British media. He was presented as a hero. 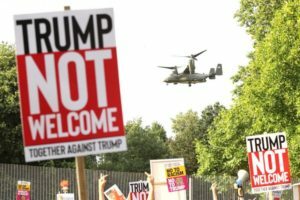 Trump is anti-war, and so gets the treatment from the financial interests that run Britain’s media. I do not wish to seem sexist, but Melania looked fab! Yep his family lines go way back, just like all the rest. And just like all the rest, he is taking the piss. If anybody wants a really good laugh, may I suggest you seek out a recording of Channel 4 News from Friday 13th July 7pm edition. An absolute COMEDY CLASSIC, and certainly one to keep and show amazed friends in years to come. Highlights were sleazy slime ball satanist Matt being owned live on air by Trump’s pal Korda, the parade of mongs they vox popped and the camera zoom out at the end to Frei’s proclamations of ‘hundreds of thousands’ of attendees to show about 300 people left in Trafalgar Square. I was enthralled for the entire hour to watch the death throes of the NWO live on my very own telly! That should say Matt Frei above. I’ll have that c*nt’s head on a STICK I promise you.